When our recent study met significant skepticism, we weren't surprised. After all, we ourselves remained skeptical of what we were seeing throughout our investigation. But repeated and varied experiments convinced us our conclusions were correct: New brain cells don't grow (or are extremely rare) in the adult human hippocampus, a region important for learning and memory. The birth of new neurons in human memory circuits, in other words, declines during childhood to undetectable levels in the adult. 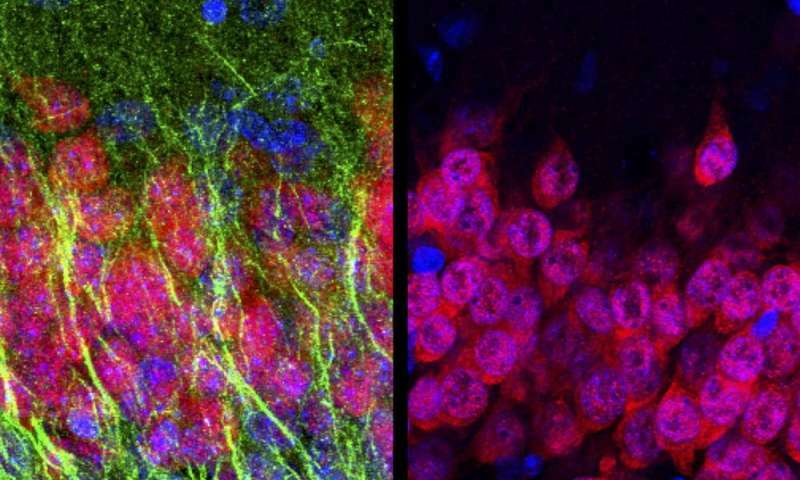 Our research findings sparked healthy debate because for about 20 years, brain scientists have thought that neurons continue to be born in the adult human hippocampus. The question of whether and how new neurons are born in adults is important for understanding how our brains adapt to changing life circumstances and how we might be able to repair brain injury. Science advances with the collection of more evidence that helps refine and revise theories. As neuroscientists, we too are adjusting our ideas of how adult human learning must work in light of our recent study. One of us, Arturo, has been studying how new neurons are born and integrated into brain circuits since the 1980s. He was a member of Fernando Nottebohm's lab at Rockefeller University, which was at the time producing a groundbreaking series of papers showing that the brains of songbirds produce new neurons each season as they get ready to learn new songs. Earlier research from the 1960s had found evidence that rodent brains produce new neurons during adulthood, but this idea remained highly controversial until Nottebohm's songbird studies convinced most neuroscientists that adult brains could make new neurons. Since then, several studies have found signs of new neurons in the adult human hippocampus, leading many researchers to accept that this part of the brain could renew itself throughout life in people too. The idea stimulated interest in figuring out how to increase this regenerative capacity and perhaps stave off age-related declines in brain function. 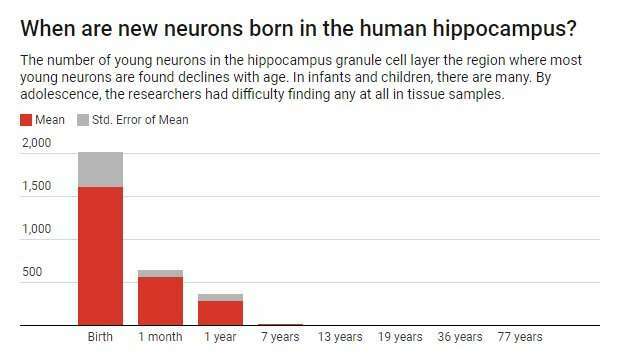 In fact, we began our own search for newborn neurons in the adult human hippocampus because previous human studies had estimated 700 new cells are born in the adult hippocampus per day. We wanted to contrast this with another region of the brain where we had recently reported finding far fewer new neurons than seen in other animals. The first sign that something different might be occurring came when Arturo visited the lab of our collaborator Zhengang Yang at Fudan University in China to study several well-preserved human brain specimens. 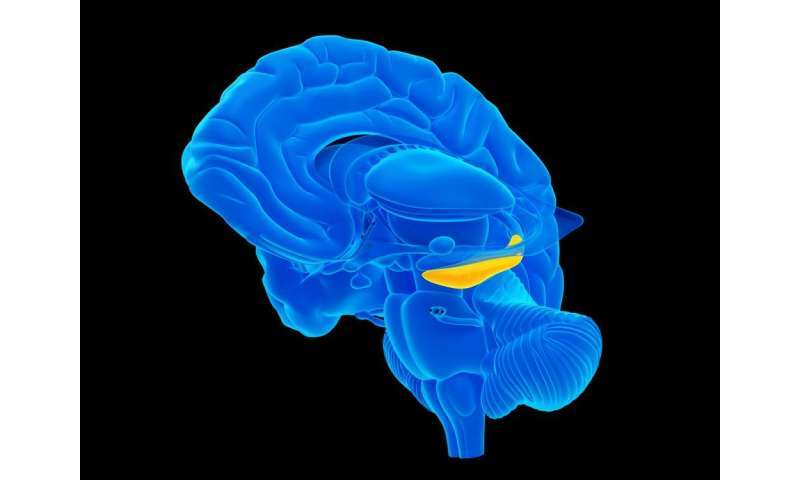 They were not able to detect any new neurons in the adult hippocampus at all. When Arturo returned from China to our lab and shared with Mercedes and Shawn the observation that new neurons were missing from the adult human hippocampus, we were faced with a challenge: How do you prove a negative? How could we be sure that we weren't just missing the new neurons that other studies had seen? As some critics have pointed out, identifying new neurons in human brain tissue is complicated. Typically, researchers look for the presence of certain proteins that we know are produced by young neurons. But we were looking at donated brain samples from dead people; maybe these "identifier" proteins degrade after death. They may also have other roles and be produced by other kinds of cells. So we needed to use multiple approaches to look for new neurons. First we examined several different proteins that are present in young neurons. We next studied the cells closely with high-resolution light and electron microscopes. We wanted to be sure that any cell we would report would have the distinctive appearance of young neurons; they tend to have a simpler shape that differentiates them from mature neurons, which are usually bigger with long, elaborate branches. We also looked at overall patterns of gene expression in this region and observed a similar decline in genes associated with young neurons. In addition, we looked for evidence of the stem cells that make young neurons, which have their own protein markers and can be detected when they divide. None of the adult hippocampal tissue we examined with these techniques showed evidence of young neurons or their dividing stem cell parents. To make sure that our techniques were even capable of detecting young neurons or dividing neural stem cells, we looked at the same region of the hippocampus before birth, when we knew they should be present. In these fetal brain samples, we clearly saw plentiful new neurons. Using the same techniques, we then looked for these cells in brain tissue from people who died in infancy, childhood or early adolescence. We saw the number of new neurons sharply declined until few remained by the age of 13; by 18 and 19 years, we could not find any. If neurogenesis continues in the adult human hippocampus, it is a very rare phenomenon. Could our inability to see these cells be due to unknown differences between young and old brain tissue? We knew that there are very rare young neurons in other parts of the adult human brain, so we looked in those regions. When we readily found those rare young neurons, we became more confident that what we were seeing, or not seeing, in the hippocampus was not simply an artifact of aging brain tissue. Could something about the patients' history prior to death, or the way the samples had been collected have obscured evidence of new neurons that had been present when the brains had been alive? To convince ourselves that the tissue was as representative of adult brains as possible, we studied brains collected by many different collaborators around the world and saw the same results. Could the time between death and preservation of the brains lead to our inability to detect young neurons? To test this, we collected more than a dozen tissue samples from patients who were having brain tissue removed as part of surgical treatment for severe epilepsy. These are samples we collected and preserved quickly to maximize their quality. In addition, we looked at two samples where the brains had been collected and preserved almost immediately at the time of death and saw the same results. In total we examined 59 brains, a collection comparable to previous studies. In all these cases, we saw the same results: no signs of new neurons in the adult hippocampus. 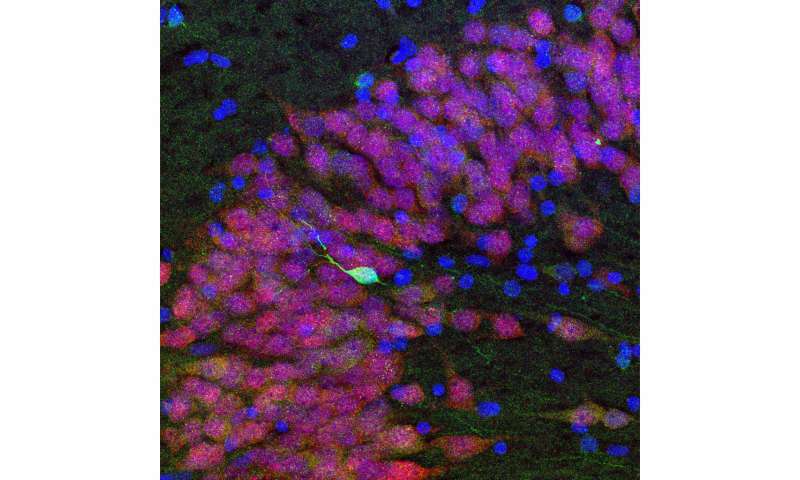 We concluded that if new neurons are being born in the adult human hippocampus, they are extremely rare. So what have other researchers seen that made them believe that new neurons are born in the adult human hippocampus? Previous studies frequently used only a single protein to identify new neurons. Unfortunately, we found that the most common protein used to do this, one called doublecortin, can also be seen in non-neuronal brain cells (called glia) that are known to regenerate throughout life. One other research group tried a different technique more commonly used by archaeologists and geologists: carbon-14 dating. This is a very creative way to determine the age of cells, especially in a field where we need new ways to study the human brain. However, it's not clear how precisely this method can identify neurons or if there are other reasons the radioactive carbon levels might change beyond the cell division that would lead to new neurons. Our research left us with the lingering question – why does this decline in neurogenesis happen? Why does the hippocampus continue to create new neurons into adulthood in other animals, but not in the human? To wrap our heads around this question, we examined the hippocampus of macaque monkeys, which are known to continue producing new neurons into adulthood. Using labeling techniques that are not typically possible in humans for ethical reasons, we tracked the generation of new neurons in living animals. We discovered that the neural stem cells that generate new neurons coalesce into a ribbon-like layer in the monkey hippocampus before birth. This layer was present and contained dividing cells even in juvenile monkeys. When we looked back at our data from the newborn human hippocampus we saw that the stem cells did not organize themselves in this fashion – a clear developmental difference between human brains and those of other primates. Our study only pertains to the hippocampus; many other brain regions in the human brain – which is very big – have not been investigated and remain to be explored for the possible presence of new neurons. The development of better methods to directly study the human brain will help researchers understand more about how plasticity occurs in the human hippocampus. And future research can work to determine if there are ways to reignite the birth of new neurons in this region. But what does our finding mean? Should we lament the lack of new neurons in the adult human hippocampus? We think not. First, the process of making a new neuron is fascinating and is already teaching us many new things. Adult neurogenesis should continue to be an area of study in birds, mice, rats and other species where it occurs. One day this work might teach us how to induce it in the human brain. Second, our brains operate for decades – much longer than the mouse brain, despite the rodent's plentiful new neurons. Indeed, the long lives of humans may be linked to the decline in hippocampal neurogenesis; we might run out of progenitors in childhood. Our work also raises new questions – clearly a rich and healthy lifestyle does improve our brain function and hold back the decline of age, even without new neurons. Developing a deeper understanding of human brain development may yet provide new treatments and therapies for brain diseases of aging.